Los Angeles Party Pianist, Composer, and…Irish Whisperer! 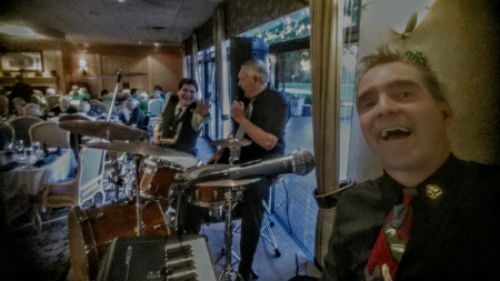 Teamed up with local sax sensation Jim Scimonetti who is amazing to play with he goes out into the audience and dazzles them and even plays two saxes at once..and Super band leader/drummer Bob Sullivan we dazzled the crowds at Los Posas Country Club for the annual Saint Patrick’s Day Diner! It was great fun. We played every Irish song -jig, reel and the like that we knew and alternated with great dance tunes and had the place dancing and singing a long! Playing amazing music for cool people, it’s a blast! Can’t wait til our next Irish Gig! Know anyone who needs amazing music? Let me know.